News is below twitter feed. Lew's Wikipedia entry is here. to PulsipherGames.com/Pulsipher.net, a web site for supplementary material and playtesting of games designed by Lewis Pulsipher (Britannia, Dragon Rage, Valley of the Four Winds, Diplomacy variants, Sea Kings, Doomstar, RPG material, etc. ), and for teaching about games. I issue a video-screencast (usually about game design) weekly (Thursdays) on my YouTube "Game Design" channel. I started playing games about 60 years ago. I started designing games more than 50 years ago. My first published (non-commercial) games appeared in the early 1970s, and my first commercial game over 35 years ago, in 1978 (Diplomacy Games & Variants), followed in 1980 by Swords and Wizardry. Most well-known: Britannia. Latest: Hastings 1066 (Worthington) has been sent to those who pree-ordered, I'm told. My copies should arrive soon. I couldn't ask for better than this. (Though he doesn't even mention my name, does he?) "Lunchtime wargame" is an interesting phrase. (Though he doesn't even mention my name, does he?) "Lunchtime wargame" is an interesting phrase. I call it a modern example of a microgame. "5. Sea Kings by Lewis Pulsipher — This one is a light board game that’s easy to teach, easy to set up, and quick to play. I had no problem getting my son (age 13) and his friends to play it. I even got a six player game together with some kids that were even younger. Unlike a lot of euros, there is an element of direct conflict in the advanced rules. The inclusion of rules that allow players to settle without using a card in order to take over over players settlements makes the gameplay much more dynamic. There’s also just enough history baked into the game to inspire young people to do some further reading about the world the Viking raiders lived in." I think the game's niche is two-fold: for younger players (as Jeffro discusses), and for people who are not used to hobby games, or who only play the party games that have become part of hobby games (such as Cards Against Humanity and its many derivatives). It's not a typical Lew-game at all. See also these more wargamelike rules for Sea Kings by Jim Lawler (and me). My "handle" is always lewpuls. I have created a Patreon page to support my YouTube channel and blogging. For those who don't know, Patreon is much like Kickstarter insofar as it enables individuals to support worthwhile projects. But unlike Kickstarter, this is continuing, monthly, support (at a level as low as $1 a month). Producing a video a week has interfered with my other activities (including text blogs), and may be one reason why it's taking me so long to get Britannia's new edition together. If I can sufficient support via Patreon I can continue to justify the time I'm spending to produce free material. I appreciate the support I receive - and there are a few perks involved, as well. Hastings 1066 was successfully kickstarted (still available on preorder), originally for May. I received the proofs 28 April. Released in January 2019. Hastings 1066 (Break the Line system, using cards arranged so as to create a board for maneuver) It has engendered Isandlwana and Gettysburg (both by the Worthington guys) and Stalingrad and Waterloo (and an ancient naval battle game) by me . These are all two player games, though Mandate has a 3 player version (the most you can get with blocks) and all the Diceless Wars games have partners play built in. I love the Diceless Wars system, which I think is as good in its way as the Britannia system has been. Pre-order prices are much lower than the list price. That's your advantage for ordering early. Your credit card is not charged until some weeks before delivery. I have a game available on the new system that is at least close to unique. I didn't set out to make it unique, it just turned out that way. Space wargame Crashing Suns (Diceless Wars block system) has engendered Mandate of Heaven (Chinese rebels after the fall of a dynasty) and a WW II Eastern Front game, plus a WW II Western Mediterranean air-sea game. In 2019 I intend to be at Rapier Con (Jacksonville), PrezCon, Swampcon (maybe), WBC. Not GenCon or Origins, as usual. Up into the 40s now. Doomstar. My game Doomstar, in video form, is available on Steam ($9.99). Brief (1:15) video about "Lew Pulsipher's Doomstar". Doomstar is vaguely Stratego-like, but immensely more fluid and quick to play, and much less hierarchical. A key is that two fighters can move together over great distances, and combine attacks together. The list price for my book "Game Design" is now $19.99 (original list price $38). This is much less than the price for any game design book I know of (not counting "anthologies" with many authors). Doomstar: I had an unusual experience for a game designer at the UK game Expo. I watched an unpublished prototype that I had designed being played long after I had "finished" it. This in itself is not an unusual experience, because I sometimes leave a prototype for years and then come back to it. But in this case, I didn't watch just one game been playtested, I watched more than half a dozen. The game is a tactical space wargame that I call Doomstar, which is being converted to video. The idea is that the video version may help convince someone to publish the physical version. The game is vaguely reminiscent of L'Attaque/Stratego, but immensely more fluid and less hierarchical, quite a different (and I think, better and much shorter) experience. As always, check my twitter feed (above, or @lewpuls) for latest. Dave Shapiro on Quora answers the question "What's the best book on board game design?". He suggests four in order of usefulness. My "Game Design" is first. My book publisher pointed me to a (favorable) review of my book in Game Nite, a free tabletop game magazine. 8 issues available. http://gamenitemagazine.blogspot.com/ Looks good and the price can't be beat, each issue about 80MB. The review is in #8. It's not unusual for a game to use a system that's been successful in another game. But sometimes one game grows out of a small bit of another. Though contemporary gamers (especially video gamers) tend to dislike constraints, practically speaking games ARE merely sets of constraints. Properly specified constraints can make the game especially interesting. for the player(s). Some people suppose that there's a "solution" to (over)saturation of the downloadable game market. There are lots of schemes, but I don't see any solutions in this detailed examination. It seems too many DMs are guilty of letting players push them around, resulting in a waste of time while a player tries to convince the MD that such-and-such wildly unlikely occurrence should be assigned a decent chance of happening. When you enforce the game rules (and physics) you simply the game and keep it moving along, you aren't stifling creativity. Yes, the dead-kobold wielder actually said "You're stifling my creativity." Poppycock! Game design is a series of compromises, and major compromises can occur when reality and what's practical in a game clash. Some "practical decisions" result in behavior that has next to nothing to do with reality. Despite an overall 22% decrease in WBC attendance at the new venue, the Brit tournament had more participants than last year. GM Jim Jordan has written an account (PDF here). I spent 8 hours at the first Prototype Con in Kissimmee, FL Saturday. Perhaps 125 people, all in one convention room in a Ramada that was, unfortunately, on the main drag to Disney World, so traffic (three lanes each way) was very heavy, even on Feb. 20th. I met Mark Gelstone and Nick Seddon, who appeared to be just about the only other people interested in wargames at the con, which was dominated by "parallel competition" games (interactive puzzles where you can do little or nothing to affect other players). We talked about Mark's enormous WW II game at length, then they played a new two player version of Introductory Epic Brit (3rd edition prototype), which worked out quite well! The intro version is much more freeform than historical Brit, and that permits one arrangement of four colors for two players that looks fairly workable. Mark's game is a labor of love; not the prettiest physical prototype I've ever seen, but probably one that has more hours in it than any I've seen. But it's far too large to be practical for publishing, I'd guess it would cost $200 at typical wargame print runs. But it models WW II in several quite interesting ways. Out of the blue, Jason Levine of the Dice Tower asked to interview me (video) for a bit. I asked "about what" to try to prepare (as we were walking to the location - they had to leave soon) but the answer was something like "anything and everything" in games. Release URL above. My video-screencast about this and some other small conventions held in February is now on YouTube at https://youtu.be/NwdAiUuVZ0E . Evidently, Prototype Con is being replaced by Expedition Prototype Con 2017 in Kissimmee, Feb 24-26. https://www.facebook.com/events/202467140206345/ This has been put together rather late: first posts on Dec 3. Most of my blog posts these days point to screencasts I've released on my YouTube Game Design channel. But a recent one is 3,500 words about game players and preferences, and types of games. "Ruminations on Types of Games and Game Players, Arising from a Sojourn". I'm adding about 20 short classes (20 minutes to an hour) to Skillshare.com in the coming months. Skillshare is a subscription-based service, you pay the monthly fee (which they hide - I can't find it, it's either $10 or $20 a month, though I've seen 99 cents for first three months) and you can participate in any of their nearly 3,000 classes. Their approach is much more self-improvement and arts than the tawdry "get rich quick - nothing's as important as money" malaise that characterizes Udemy. Sea Kings scoresheet: I've provided a copy of the scoresheet I used in my prototype of Sea Kings. It is much more functional than the scoring track on the published board. Explanations and PDF/JPG here. Learning Game Design, Part 2: $40. This is the second part of the restructured "Learning Game Design as a job or a hobby"
This is by far the most comprehensive discussion of game playtesting in the world, to my knowledge. Converted to words, it's the size of a small novel, in 64 parts, including examples of playtesting notes I've taken over the years. I'm sure I'll be adding to it as time passes, as well. This is the largest discount I can give, even though it’s twice what my coupon was in the past. If you have found one of my classes worthwhile enough to go through most or all, I'd appreciate you giving the class a Udemy rating/review. While the ratings on Udemy are not trustworthy - there are several schemes for getting "5s", including some where the instructor pays someone! - some people pay attention to them. I'm available as a guest for podcasts interested in someone who knows a lot about game design and the industry, and has very long experience as well. Me. I speak reasonably well on the fly - listen to my Boardgame University with Tom Vasel (#27) at http://boardgameuniversity.libsyn.com/. I've been testing an alpha build of a computer version of one of my unpublished board games (being programmed in the UK). It is a space wargame, vaguely reminiscent of Stratego but far more fluid, yet much quicker. No estimate when it will become available. The NC State student newspaper asked to do an article about me in connection with the NCSU Tabletop Gamers Club. The photographer took dozens of photos, kind of surprised by the one they selected. Sea Kings can be ordered online from the publisher (free shipping) at http://worthingtonpublishing.com/?product=sea-kings Five photos are here. Video: Jason Levine interviewed me at Prototype Con. 13+ minutes. http://www.dicetower.com/game-video/jason-levines-designer-spotlight-lewis-pulsipher. I had no warning and no prep time for this, I'd say I held up fairly well. Pacific Convoy. Worthington have stated in their newsletter that they will publish my vaguely Stratego-like game Pacific Convoy. It's on a hex board, lots of space, and all pieces can move at least two hexes (straight line only). It's much less hierarchical than Stratego, as well, and two air pieces can move in the same turn. Different victory criteria, as well - you need to get a transport to the other side of the board, no flag or command vessel to hunt down. @osohombre says "and it was one of the most engaging BGUs!" So I must have done something right. And Tom must have asked good questions. The game covers all of Europe and North Africa, from the fall of the Roman Empire to Tamerlane and beyond. With some 500 pieces, 35 nations, and 106 areas, it lasts 10-12 hours with experienced players. When I began to think about doing a new edition of Britannia, around 2004, a 1980 all-of-Europe game I had done while developing Britannia. Though not as big as Conquest Europa, it took 12 hours to play the first time, so I set it aside and then completely forgot about it. One of the first new games I started when I came back into the hobby was an all-Europe game, which was playtested at WBC in 2008. It turned out to be a natural five player rather than four player game. Someday it may see print, perhaps in Against-the-Odds magazine or annual. In the meantime I've devised another all-Europe game that lasts about two hours, and has been played in 1:40. These games both end with the Mongol invasion, after starting with the fall of the West Roman Empire. I have spent a great deal of time testing the full Historical Version of the new edition, which is a "more accurate" representation of history than past editions. The Introductory version of that game is much quicker, a "freeform" version. But the versions that will likely attract the most people are standalone, separate games, a short (as little as 1:24 in non-solo testing) version and a diceless (2-3 hour) version. Discussion of testing is at the Eurobrit Yahoo Group. Amazon's current price of the book is $34.20 for paper but just $14.74 for Kindle! List is $38 for paper. If you've read this book, I'd appreciate you posting a customer review on Amazon. From ARBA vol 44 p. 16 (final sentence): "Although a single book cannot substitute for education in game creation or practice, this book provides useful tips and resources for game designers and those interested in entering the field." This is another professional, subscription only journal so I cannot provide a URL (I got a non-convertible PDF from my publisher). Pages 25 ff in Diplomacy World #121 (April '13) contains Jim Burgess' rather stream-of-consciousness review of the book, as related to the game Diplomacy. Diplomacy World has been the flagship magazine of Diplomacy fandom for over 30 years, and recently under editor Doug Kent is a massive quarterly free download at http://www.diplomacyworld.net/. I was active in the hobby in the 70s, and have designed more published Diplomacy variants than anyone, I think. New (7 Feb 13) review by Michael Fox at Little Metal Dog Show (a well-known UK game blog). "Rather than having someone standing in front of you, telling you what to do to move on, Lewis’ writing feels more like he’s sitting by you, making helpful suggestions on how to get out of sticky design issues and encouraging you to think your way through the stages of your game." Book review - Game Design by Joe Huber (3 Dec 12). "So summing it all up, Game Design does an excellent job of providing a path to become an effective game designer." Review: Lewis Pulsipher’s ‘How to Design Epic Games' by David Bolton. (Yes, he knows the actual title.) "If you want to design games, as opposed to just produce them, this is a great book. It hits the ground running, though you’ll need to read it quite a few times for everything to sink in. . ."
From a reader review on Amazon.co.uk: "There is scarcely a spare word in this book, and that's a good thing. You know the author is not wasting your time because he is not wasting his. . . . He gets to the point: "You want to make games, Johnny? The only way to do it is to do it". I know it seems obvious, but sometimes you just need to be told, and it's refreshing not to feel that the author is winking at you like they have a secret which they've promised to share and never do. I did not feel that this author held anything back, and now I have something really extraordinary on my shelf: a textbook that's not only become my go-to reference, but also an inspiration - believe it or not, it's exciting!" The book is available in a "Nook Book" (ebook) edition from Barnes & Noble for $24.99 (used to be $13.74). The book is available in a Kindle edition for $17.99 (used to be $14.74) (compared to $38.00 for the paperback). Kindle is Amazon's format, but with a free app you can read Kindle books on PCs. You may know that you can get a free PC program that lets you read (and buy) Kindle books. I don't know if something of the same kind is available for eBooks. Books-a-Million are offering NookBook copies of my book at $24.99 (used to be $28.65). eBook is the standard for e-readers other than Amazon's Kindles. The PDF version is no longer listed. I have not seen a copy of either of these formats. Something to keep in mind for future contracts, getting a copy of the electronic versions. The first 27 pages, and page 268, of my book are readable on Google Books. The book is now being offered by some small sellers for less than the majors are selling it for (paper version). It's available in the UK from Amazon UK and Waterstones.com. "I found your book to be very useful Lewis because it doesn't have a one size fits all approach. There are a range of issues to consider and solutions offered for a variety of challenges in game design. I was able to check issues I'd come up against in my game design and find either that I had approached things in one of your recommended ways (due to intuition or collective consideration by our game dev group), or you gave me new ideas to try or things to check. Scott Nicholson wrote recently to let me know that "I've decided to adopt your game design book as my primary text in my 'Transformative Game Design' class I'm teaching in the spring at Syracuse University. I reviewed a wide variety of game design texts, and found yours to be the best for what I need! Thanks, Scott. The book is "Game Design: How to Create Video and Tabletop Games, Start to Finish". Dr. Scott Nicholson is an Associate Professor at the School of Information Studies at Syracuse University and the director of the Because Play Matters game lab. He's well known for "Board games with Scott". Transformative games are games intended to change the player in some significant way. People outside the USA might consider using Book Depository to order, as they have free shipping to about 50 countries. I have not used it myself but see references to it. I am using twitter regularly now. I am @lewpuls. After sales of 16,000 the FFG version of Britannia has sold out (though it's still available in some stores, FFG has no more). I've received a notification from FFG that the contract is terminated. So I have been looking for another publisher for a revised edition, and have two strong candidates. There's a smaller, diceless version ("Rule Britannia") that uses a new board (21 land areas including Ireland); and a quick, really small (nine nations) "Gateway" version (no set title, tentatively "Britannia Brevis") that also uses a new board (18 land). The Gateway version appeals to people who like Risk and Axis & Allies (but remember, 60-90 minutes) and to video gamers. Rule Britannia should appeal to people who don’t like dice (battle cards, each player has an identical set). Less than three hours. There's also an "Ultimate" version that uses the standard board with the addition of Ireland, and will be significantly longer than the standard game (Epic, get it?). But it will be an expansion, not part of the standard package. Ireland will be on the standard board, even though it won't be used in the standard game. The standard game (likely called "Epic Britannia") will come with several shorter scenarios (4-9 turns), and a new three player game that I am trying very hard to balance, and a 6-7 turn game that covers the entire period using the same colors/sides, and will take half as long to play. My book "Game Design: How to Create Video and Tabletop Games, Start to Finish" is available. Publisher's web page for the book. Amazon. As you might expect, I make a lot more from a copy ordered through McFarland than through Amazon, but most people use Amazon's free shipping. It can be ordered from McFarland or from retail book sellers. Because McFarland's first market is libraries, you have an alternative not practically available for most books: you can request that your library order a copy. Many public libraries will respond to suggestions/requests, though many of those want more than one person to make the request. Why would you read a book? While the book is no longer the absolute treasure trove of information that was when I was a kid (see below), it still organizes information in an easily digestible form. But more important, a book can convey the experience of the author to the reader, and if that experience is valuable than this is something the reader won't get anywhere else. A major purpose for me in writing the book is to help beginning game designers avoid the "school of hard knocks" that I had to go through, applying my experience in teaching novice game designers as well. When I was a kid in the 50s and 60s, if you were lucky you had three television networks to watch instead of two, there was no Internet and consequently no e-mail, no cell phones, no personal computers (or printers), no World Wide Web, no Facebook, no Twitter, no YouTube. A long distance call of any length cost real money. I first saw color TV in a person's house when I was 10 (trick-or-treat: the people let the kids come in and see their cool color TV). Music was on vinyl LPs and (later) cassette tapes. If you wanted to watch a movie you stayed up after 11 (old movies only on TV) or you went to a theater, there was no way to record a movie other than film. There was no instant replay on sporting events because videotape had not been perfected. In that era, as for generations before, a book was a treasure trove of information, something to be read carefully and absorbed as much as possible. Nowadays people are much less impressed by books because there's so many other sources of information, but if you really want to learn about something in depth a good book is the best way to do it other than having an experienced person teach you directly. I was the guest on the Ludology podcast #26 about epic games (tabletop games, not the video game company). This is the only podcast I listen to, because it's about "the why of games", not about new games and community chit-chat. I've also converted this to a video that is on my Game Design YouTube channel. My blog is posted, now, in as many as five places, reaching a quite different readership at each place. The blog has existed since 2004 but I "spread out" only in 2011. The "home" is at: http://pulsiphergamedesign.blogspot.com/; on Boardgamegeek (and the other geek sites); on boardgame designers forum; on "Fortress: AT" ("Ameritrash"). Some, but not all, of the posts are also on my "expert" blog on Gamasutra, the site for video game professionals. The sometimes-lively discussions at BGG, fortress:at, and Gamasutra, where most of the readers are, are usually very different from one another. 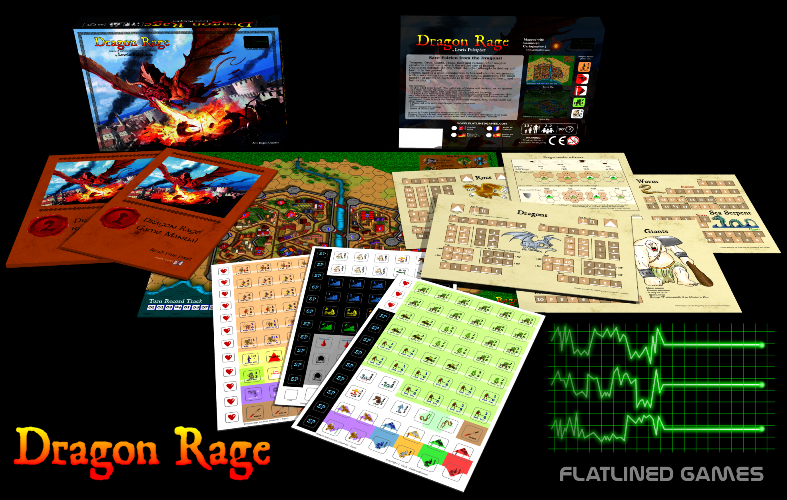 Dragon Rage is now distributed in the USA exclusively by Iello. I understand the print run as a whole is practically exhausted. There is some possibility that a Kickstarter will be run to help fund a large reprint that is likely to reduce the price. A very complimentary Dragon Rage video review (in accented English this time) that could be used as a tutorial before people play their first game. On Youtube. Also on BGG with comments. Michael Barnes' review on fortressat. Boardgamegeek's video about Dragon Rage. A review of Dragon Rage appeared in a British blog. Also on BGG. Video review, in German, of Dragon Rage. A review of Dragon Rage on Opinionated Gamer. Another review on Opinionated Gamer (scroll down past Rumble in the Dungeon). Another review, from "Fortress Ameritrash"! I have to quote this one: "It’s an absolute grab-bag of fun fantasy memes and is certainly the most customisable wargame without miniatures that I’ve ever seen." The multi-contributor ETC Press book "Tabletop: Analog Game Design," edited by Greg Costikyan and Drew Davidson, is now available (electronic downloads free). Greg briefly describes it. Downloads here in electronic book and PDF formats. My piece on "The Three Player Problem" is the first chapter in the book. Slides and audio recordings of my game design talks at UK Game Expo and Origins are here. The reissue of Dragon Rage is in print. The game (published in Belgium) is available in American stores, or direct from GameSalute. You can order from www.flatlinedgames.com. The physical components are very impressive (compared with the original microgame), on a par with Britannia. The hit recording sheets are full-size plasticized cardboard, as opposed to the original notepad. The board is fully mounted, and has an orc lair on the opposite side, with new scenarios. You can see from the photo that the pieces are individually cut and have round corners, not like the typical wargame with square-cornered little pieces. This version includes a second map (of an orc lair area, more or less) and additional scenarios for it, devised by Eric Hanuise. Welcome to PulsipherGames.com/Pulsipher.net, a web site for supplementary material and playtesting of games designed by Lewis Pulsipher (Britannia, Dragon Rage, Valley of the Four Winds, Diplomacy variants, RPG material, etc. ), and for teaching about games. I started playing games more than 50 years ago. I started designing games more than 45 years ago. My first published (non-commercial) games appeared in the early 1970s, and my first commercial game over 30 years ago, in 1978 (Diplomacy Games & Variants), followed in 1980 by Swords and Wizardry. After publication of several commercial games, and after I earned my Ph.D., I took 20 years off from designing games, though I played and made up adventures (which is level design) and refereed lots of Dungeons and Dragons while learning computing, programming, networking, and making a living. In 2004 I decided to get back into game design rather than write computer textbooks, though my primary profession is college teaching. I taught my first course in game design in fall 2004, though I did not teach games full time until fall 2007. I do not run a public Web discussion board on this site, as Boardgamegeek.com serves the purpose very well. The Eurobrit Yahoo Group is the main location for Britannia discussions. Fantasy Flight Games also has a discussion board (generally inactive) at their Britannia site. Most of my new writing about games is posted on my blog, http://pulsiphergamedesign.blogspot.com/ or at http://teachgamedesign.blogspot.com/, or on GameCareerGuide.Com. Dr. P's personal recommendation for those who want to get into the game industry and live in this area (central-eastern North Carolina). Lewis Pulsipher and Pulsiphergames.com do not accept or consider unsolicited submissions, ideas or materials, such as games, game ideas, treatments, books, story ideas, or characters. Any unsolicited materials submitted will be disposed of without review. Recently played video games: Gratuitous Space Battles, Angry Birds, and several "social network" games. I played the latter (all Zynga games) because I was talking with them about the possibility of working as a game designer in Bangalore India. But the current emphasis in these games is on frustration (to persuade people to spend real money), and that's the opposite of what I want to create. Further, I suspect Zynga is stuck in the rut they've made, a company so large that they may not be able to risk trying games drastically different from the ones they now support. I know what kind of social network game I would make, first and foremost to make it truly social, not solitary. More recently I've reconciled myself to using Steam and have bought Civilization V and Skyrim to go along with Portal, but who knows when I'll have time to play them! I have never designed a published "computer game", largely because I have not known anyone able and willing to do the necessary programming and artwork. I have never been interested in starving in order to produce a video game. Nowadays, of course, computer games are the products of teams, not of individuals. Back when one individual could write a game, I was a database programmer, which doesn't help much with computer games, nor do I have a hint of an artist in me. 2. Video games, until fairly recently, were almost always interactive puzzles, not games. Games are about people, interactive puzzles are about computers. I like games, not puzzles. 3. For most of the age of video games, you had to work full time in the industry, yet the pay was poor (per hour worked, that is). I preferred to help young people as a teacher, get paid at least as well, and have lots of time to design games. 4. The working hours can be bad. "Crunch time" (unpaid overtime) is common, though designers are not involved in that quite as much as programmers and artists. 5. Fighting with the electronics obscures the purity of design. You worry about what the computer can do instead of what the players can do. At worst, you "hide behind the computer". People become computer game designers after working on computer games for a company in other capacities, especially level designer. Practically no one is hired directly as a computer game designer, though level designers (a subset of game design) may be hired directly from school. The production costs for "big" off-the-shelf games ($10-100 million) make a person without a track record too much of a risk. Click here for advice for those who want to get into the game industry. "We have met the enemy, and he is us." Pogo (Walt Kelly) "Enjoy the Journey"
Send mail to webmaster (at) pulsiphergames (dot) com with comments about this web site.